The airport in Mexico City is called Benito Juárez and is located in the north-east of the City, roughly 25.6 km from the Radisson Paraiso Hotel (Radisson Paraiso Hotel Mexico City to Mexico City International Airport) and 27.1 km from the Congress venue (Universidad Intercontinental Campus Sur to Mexico City International Airport). The airport has two terminals, both of which have safe taxi services that start at about 350 MXN (roughly 18 USD). Please click here for further information. There are also buses and the underground, but taxis are recommended given that the Congress is in the south of the City. The travel agents (see details below) offer taxi bookings in advance for those who booked their flights through them. Hotels also usually offer this service; for instance, the Radisson Paraiso Hotel offers this service through their concierge, starting from 370 MXN for anyone with a reservation – simply provide your flight details. Another option is to use Uber taxis via the mobile app (if one is connected to the airport Internet service), which is usually a cheaper option than the official airport taxis. For further information regarding other travel services, please click here (click on transportation). We have sourced a number of recommended hotels close to the Congress venue (see below). 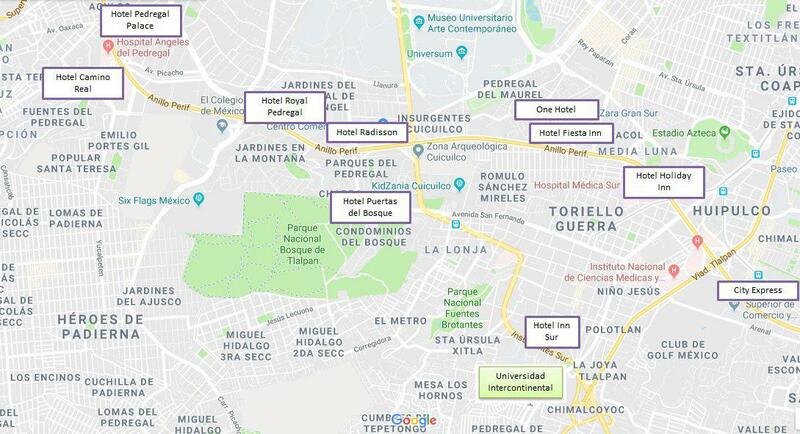 The only hotel that we can recommend that is right next to the university is the Inn Sur, but it is very low budget and not as comfortable as the other hotels listed here. A shuttle service will be available to provide transport from the Radisson Paraiso Hoteto the Congress venue. The Congress organizers are happy to respond to requests for additional guidance. Please email support@npsa-association.org. Airbnb also offer a large range of possibilities. For further details, please click here.